GALAX has developed a GeForce GTX 1070 graphics card with an ultra-slim one slot wide cooling system. The industry’s first single-slot GeForce GTX 1070 is understood to be released in China in early 2017, but it is unknown whether the video card will ever make it outside of the country. Single-slot gaming graphics adapters for high-performance cards are not a common occurrence, especially as most AIB partners now run dual slot for anything 75W for over. After developers of GPUs for years have developed dual-slot designs for their coolers, the vast majority of motherboards have enough space to install at least one single slot graphics card. Nonetheless, there are systems equipped with extra add-in-boards (audio, SSD, additional SATA or Thunderbolt 3 controllers, etc.) that require slim single-slot components as there is simply not enough space inside. Meanwhile, it is not easy to find high-performance single-slot graphics cards: even some low-profile boards feature doublewide radiators. Companies like AMD and NVIDIA release professional graphics cards with slim coolers (e.g., Quadro M4000, Radeon Pro WX7100 and so on), but such products are not intended for general consumers because of high prices and some other peculiarities. By contrast, the forthcoming GeForce GTX 1070 from GALAX is a high-end consumer product with a single-slot cooling system. The upcoming GALAX GeForce GTX 1070 uses a copper radiator with very thin fins and a metallic cover. Copper quickly absorbs heat, which is why it is used to make small form-factor coolers (including those for servers). Meanwhile, to maximize cooling potential of the whole system, GALAX uses a blower-type fan that generates very high air pressure by rotating at a very high speed. Such fans inevitably generate a lot of noise, but that is a tradeoff between dimensions and performance. Copper heatsinks are typically heavy too, as well as pricier than regular GPU heatsinks. 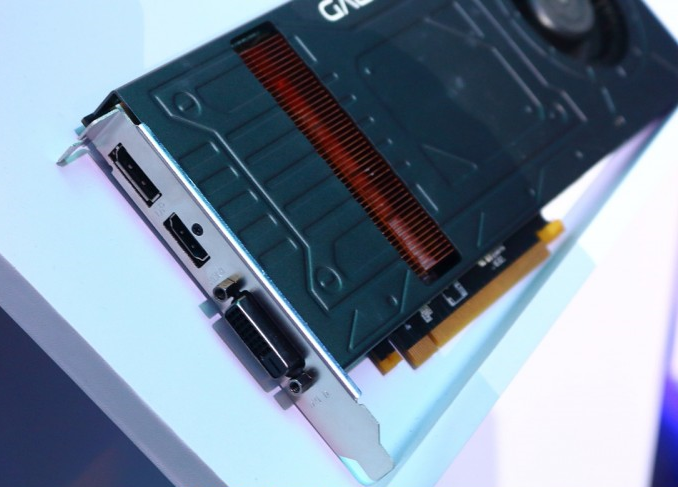 So far, GALAX has only demonstrated the graphics card at an event in China (and clearly labelled it GTX 1070 for anyone wondering) and has not revealed its frequencies or other peculiarities. Since NVIDIA’s partners are not allowed to downclock GPUs, it is highly likely that the card will run at reference 1506/1683 MHz (base/boost) clock rates. As for connectivity, the board has three connectors: a DVI, a DisplayPort 1.2 and HDMI 2.0. 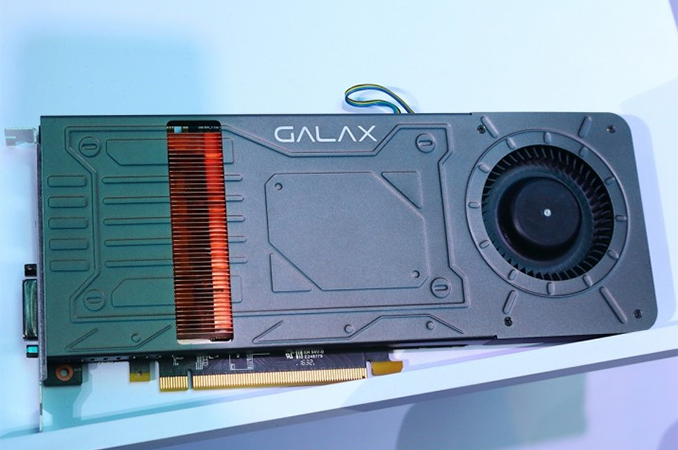 GALAX belongs to Palit Microsystems, one of the world’s largest makers of video cards. From time to time Palit’s brands release unique NVIDIA-based graphics adapters that have features not available on competing solutions. Usually, such AIBs are only sold in China, but at times they make it to the U.S. and Europe under various trademarks. There is venting at the bottom as you can see and from the source site, small slots on the inner side too, and though not shown, perhaps on the outer side as well. > and with a closed-side case the blower shouldn't be too loud. two mini DP ports, one on top and one on the bottom of the slot, would allow the card to drive multiple monitors, while allowing almost a full slot for cooling.